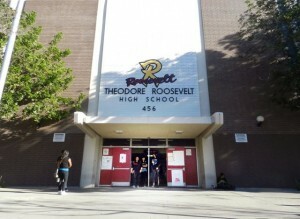 Air quality officials are monitoring asbestos cleanup efforts at Roosevelt High School after workers discovered the toxic substance while demolishing a historic building last week. The South Coast Air Quality Management District ordered “strict containment measures” to be put in place at the Boyle Heights campus, which is currently undergoing a $173 million modernization project. Inspectors visited the site on Oct. 25 and 26 after a contractor working to tear down a 1920s-era building found steam piping wrapped in asbestos, a material commonly used for insulation but which can cause cancer if inhaled. School district officials said there is no danger to students, staff or the surrounding community, adding that construction was halted once the pipe was discovered between the second and third floor of the building. In a statement, LAUSD Chief Communications Officer Shannon Haber said that ongoing air monitoring data showed no evidence that the asbestos had traveled through the air away from the site. The agency directed the contractor leading the demolition to fence off the debris pile containing the asbestos and submit a cleanup plan. Patrick Chandler, a spokesman for SCAQMD, said the agency’s inspectors were monitoring the site to ensure compliance, but could not confirm how long it would take to remove the asbestos or whether this would create a delay in the construction plans. SCAQMD inspectors previously visited the site on Oct. 10 but found no violations of agency rules, according to the statement.